As for Turkey’s phony conflict with Israel, which began with the May 2010 Gaza Freedom Flotilla massacre, has also been fully exposed when Turkey overtly supported Israel’s blatant acts of military aggression against Syria in 2013. The repercussions of the May 2013 Reyhanli false-flag bombing attacks near Turkey’s border with Syria is the latest evidence of a deep crisis of legitimacy for the United States, Britain, Israel and Turkey; the four countries whose alliance has been dominating the political scene in the Middle East and beyond since 1990. NBC: So has President Assad crossed President Obama’s red line? ERDOGAN: A long time ago. My question is, the United Nations, U.N. Security Council, are you doing what you are supposed to do? Why do you exist in the first place? What is your job? I mean, is there a deadline, like they are not going to move until 1 million people are killed? NBC: Will you encourage President Obama to get involved directly in the situation in Syria? ERDOGAN: We want the United States to assume more responsibilities and take further steps. NBC: What is the just punishment for Mr. Assad, in your view? What is your message to him today, at this moment in history? As the earlier quote from Turkish newspaper Star shows, the Reyhanli State Hospital near Turkey’s border with Syria was at the forefront of the chemical weapons propaganda over the April 29 incident. Two days after this press report, the same hospital was inundated with the victims of a far more devastating false-flag operation. No one has got the right to accuse others. Shortly after [the attacks] , Turkey’s Interior Minister [Muammer Guler] has said that they suspect that [the attacks] were connected to Syria. To put it plainly, the reason why he came up with such quick accusations without any evidence at hand, is to fabricate the evidence they had in mind. These [attacks] were directly perpetrated by Erdogan and the AKP. They are the ones who, through their intelligence and security forces, supplied Al Qaida with chemical and got them to penetrate all the way to Aleppo. They are the ones who transported terrorists, arms and deaths through their planes. Erdogan himself and his party want to destroy Syria. What occurred in Reyhanli was the ambition of destroying Syria itself. Whoever wants death and massacre is the one who carried out this massacre in Turkey. Actually, this blanket ban was mainly targeting the information flow through the Internet considering that Turkey’s mainstream media have been fully complicit in the Government’s constant war propaganda against Syria from April 2011. Nevertheless, the ban on the Internet proved to be somewhat ineffective in the face of an overwhelming sense of indignation towards to Government across the country. 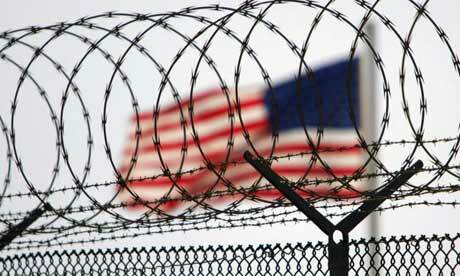 In fact, there is a long history of false-flag incidents occurring in Turkey ahead of almost every top level meeting between Turkey’s politicians and their U.S. or Israeli counterparts. For the past seventeenth months, the people [of Hatay] have been living in fear of [the possibility that] a war, for which they can find no reason, might explode on their doorstep. Hatay’s economy is stagnating, its revenues have stopped, its bread has shrunk. Hatay has enjoyed harmonious fraternity among its diverse population up until the present day. However, [the Government] is trying to disrupt this by pitting groups against each other, by emphasising differences of identity [Turkish, Arabic, Kurdish, etc.] , sectarian differences [Sunni, Alevi, etc.] . The people of Hatay are constantly hearing news of deaths and injuries from relatives [in Syria] and live in constant fear of hearing such news. BEIRUT (AP) — Israel conducted a rare airstrike on a military target inside Syria near the border with Lebanon, foreign officials and Syrian state TV said Wednesday, amid fears President Bashar Assad’s regime could provide powerful weapons to the Islamic militant group Hezbollah. Regional security officials said Israel had been planning in the days leading up to the airstrike to hit a shipment of weapons bound for Hezbollah, Lebanon’s most powerful military force and a sworn enemy of the Jewish state. Among Israeli officials’ chief fears is that Assad will pass chemical weapons or sophisticated anti-aircraft missiles to Hezbollah — something that could change the balance of power in the region and greatly hinder Israel’s ability to conduct air sorties in Lebanon. The regional officials said the shipment Israel was planning to strike included Russian-made SA-17 anti-aircraft missiles, which would be strategically “game-changing” in the hands of Hezbollah by enabling the group to carry out fiercer attacks on Israel and shoot down Israeli jets, helicopters and surveillance drones. A U.S. official said the strike hit a convoy of trucks but did not give an exact location. 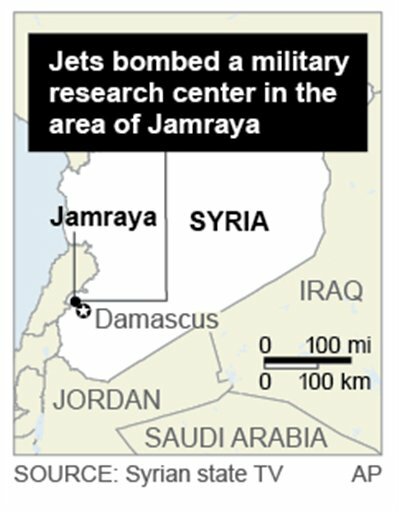 The Syrian military confirmed the strike in a statement read aloud on state TV, but it said the jets bombed a military research center in the area of Jamraya, northwest of the capital, Damascus, and about 15 kilometers (10 miles) from the border with Lebanon. The statement said the center was responsible for “raising the level of resistance and self-defense” of Syria’s military. It said the strike destroyed the center and a nearby building, killing two workers and wounding five others. The Syrian army statement denied that the strike had targeted a convoy headed from Syria to Lebanon, instead portraying the strike as linked to the civil war pitting Assad’s forces against rebels seeking to push him from power. “This proves that Israel is the instigator, beneficiary and sometimes executor of the terrorist acts targeting Syria and its people,” the statement said. The Israeli military declined to comment, and the location could not be independently confirmed because of reporting restrictions in Syria. Hezbollah has committed to Israel’s destruction and has gone to war against the Jewish state in the past. Syria has long been among the militant group’s most significant backers and is suspected of supplying with funding and arms, as well as a land corridor to Iran. This strike also comes as Syria is enmeshed in a civil war. The rebels have seized a large swath of territory in the country’s north and established footholds in a number of Damascus suburbs, though Assad’s forces still control the city and much of the rest of the country. While Assad’s fall does not appear imminent, analysts worry he could grow desperate as his power wanes and seek to cause trouble elsewhere in the region through proxy groups like Hezbollah. Syria’s government portrays the crisis, which started with political protest in 2011 and has since become a civil war, as a foreign-backed conspiracy meant to destroy the country. Top Israeli officials have recently expressed worries that Assad’s regime could pass chemical weapons to Hezbollah or other militant groups. President Barack Obama has called Syria’s use of chemical weapons a “red line” whose crossing could prompt a tougher U.S. response, but U.S. officials say they are tracking Syria’s chemical weapons and that they still appear to be under regime control. The strike, carried out either late Tuesday or early Wednesday, appears to be the latest move in a long running race by Hezbollah to increase its military power while Israel seeks to limit it.